You may place a phone order for flowers and take advantage of our free in-hospital delivery service to patients. Click here to view a selection of floral arrangements, orchids and plants. Please note hospital regulations may restrict deliveries to some departments like the ICU and the Resnick Neuropsychiatric Hospital. In addition, no flowers or stuffed animals may be delivered to transplant units. The UCLA Health Auxiliary manages and staffs the Gift Shop and has supported the Medical Center since 1955. If you are interested in the Auxiliary or would like to make a donation, contact us at (310) 825-7283 or visit our website. 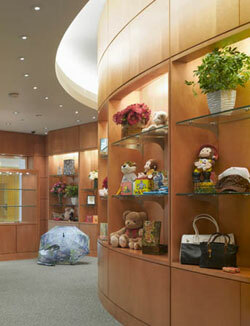 Our gift shop is located in the lobby of the Ronald Reagan UCLA Medical Center near the cafeteria.